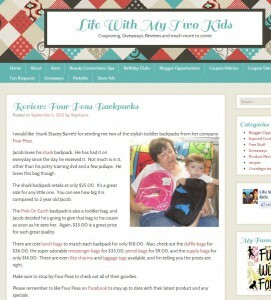 Congratulations to our Client Four Peas for their feature on Life With My Two Kids. Four Peas is home to some exciting storage solutions that are designed to fit children of all sizes along with all their necessities. From backpacks to supply bags they’ve developed a world of options that are fun, comfortable, and constructed from safe, quality materials. 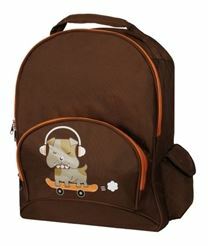 Since 2003 parents have turned to Four Peas for exclusive bags made from quality materials. As a mother of three small children, the founder of Four Peas wanted the same as all parents–only the safest most cost-effective lunch bags and backpacks possible for her kids. When it comes to safety, parents can feel confident in using Four Peas products as all bags are CPSIA compliant and PVC, BPA, phthalate, and lead free. For an added touch of fun, Four Peas can customize bags with their users’ names, transforming an already unique product into a truly personal gift. Check them out at FourPeasOnline.com.